Having a WordPress document management system makes it easy to keep all of your documents and files organized and accessible to your team. You can choose to keep it private and available to your team only or share it publicly with your site’s visitors. Although there are a number of file management systems for WordPress, only a few allow you to create a functional WordPress file manager that’s accessible from the front-end. With this in mind, in this article, we’ll show you how you can use the Posts Table Pro plugin to create a functional WordPress file manager. We’ll also explain how you can control who has access to the documents, how users can add documents, and how you can sell documents directly through the file management system. But before we begin, let’s quickly take a look at how a WordPress document management system can help you maximize productivity and stay organized. Once you have the Posts Table Pro plugin all set up, it’ll automatically create dynamic, interactive WordPress tables that display all of your documents and files on one page. An easy-to-use plugin for listing files and documents in a fully-functional WordPress document management system. Share resources within your organization. With a WordPress document management system, you can share documents and files with team members and colleagues in your organization at the same time. You can also allow them to add more documents and/or files to the list. Intuitive and user-friendly interface. 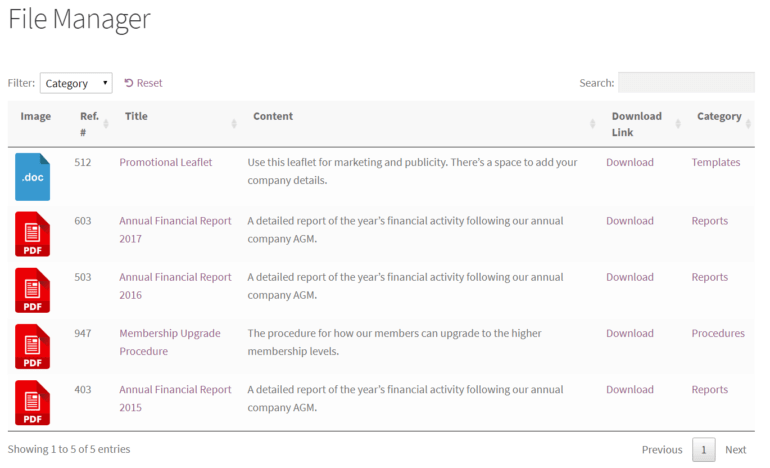 The documents are listed in a functional table layout on your site’s front-end, not hidden inside the WordPress admin. This makes it incredibly intuitive and easy to use. Stay organized. You can organize documents using categories, tags, and custom taxonomies. The plugin also lets users sort and filter the documents based on the taxonomies you used to organize them. Functional table layout. 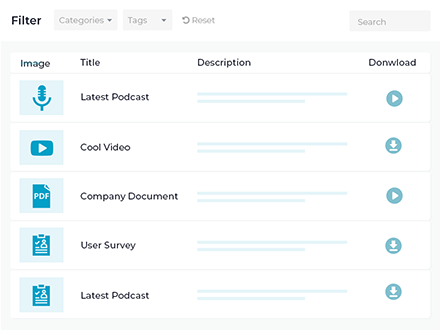 Display documents in a table layout with search, sort, and filter functionality to help people find documents easily on your website. Choose what information to display. You can choose to display different information about the documents you add to the file manager. For instance, you could display image thumbnails, the date the document was published, author’s name, file type, last updated, and/or download buttons. Link to a separate page for each document (it might contain either the full content, an embedded file from Google Docs, etc…). Add a column containing buttons, links, or icons to link to the URL for the file (e.g. if it’s located in the WordPress Media Library, Dropbox, etc…). Use the free Page Links To plugin so that users can download the document directly to their computer by clicking on the link. Small and medium businesses use document and file managers on their WordPress websites to store all kind of important documents on their private staff intranet. These may include contracts, templates, and policies. It’s also an excellent way to create an internal knowledge base or a place to store training material and marketing collateral. Having an internal file system for your organization allows you to keep all of your important documents in one place. This way, all staff members can access the documents and files whenever they need them. Now you know how you can use a file manager on your WordPress website and the benefits of using one. Next, let’s step through a quick tutorial on how to create a document file management system on your WordPress website using the Posts Table Pro plugin. The file manager will look something like this when your documents are displayed in a table layout. In this section, I’ll show you how to create a WordPress file manager for your documents and resources. Before we begin, you’ll need to purchase the Posts Table Pro plugin if you haven’t done so already. Log in to your WordPress admin panel, head over to Plugins -> Add New and click the Upload Plugin button. Next, click Choose File and find the zipped Posts Table Pro plugin folder on your computer. Once it’s uploaded, click the Install Now button to install it to your WordPress website. Click the Activate Plugin button on the following screen to activate the plugin. Finally, navigate to Settings -> Posts Table Pro and enter your license key. Click on the Save Changes button at the bottom of the page to proceed. Now that we’ve installed and activated the plugin, we need to add our documents and files to our website. The first method involves using the free Pods plugin to create a custom post type and custom taxonomies for your documents and files. You can add as many custom fields as you’d like to your custom post type. 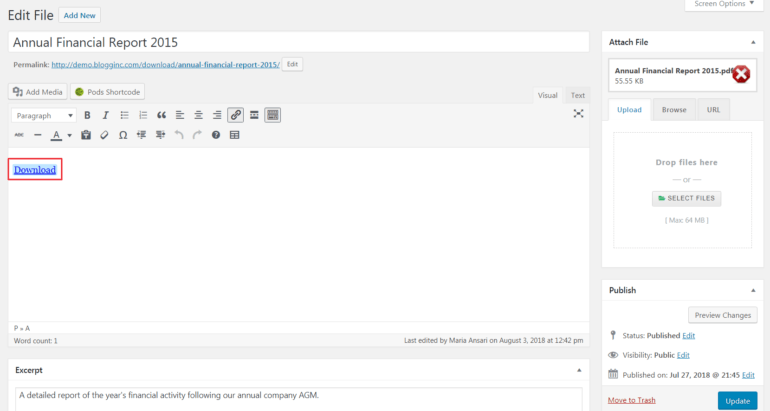 Once that’s done, you can add documents to the custom post type and display them in a searchable table using Posts Table Pro. Add as many custom fields as you’d like to the custom post type. This allows you to store unique data about each document you upload. Finer control over which fields you’d like your custom post type to support e.g. featured images and excerpts. Create as many custom taxonomies as you’d like. You have to create your own custom post type before you can begin uploading documents. Doesn’t let you see who has downloaded your files. The second method uses the WordPress Download Manager plugin which comes with a pre-built custom post type for adding documents to. You can create as many categories and tags as you’d like for organizing the documents and files you upload. Once you’ve installed the plugin and created categories and tags, you can begin uploading documents right away. Comes with a built-in custom post type for adding documents and files to so you don’t have to create one manually. Lets you add categories and tags. Gives you a complete download history which lets you see who has downloaded your files. Doesn’t give you the option to add custom fields to the custom post type. You have to work with the fields that you get out of the box. Head over to Plugins -> Add New and search for the Pods plugin. Install and activate it to your WordPress website. Next, navigate to Pods Admin -> Add New -> Create New. 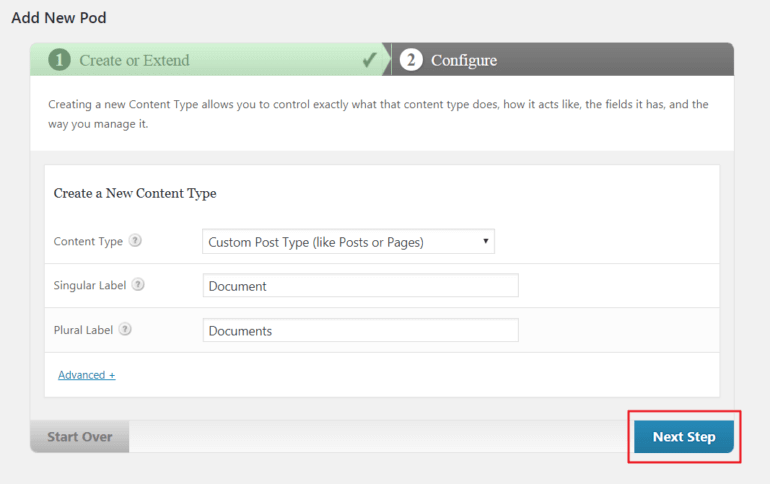 Select the Custom Post Type (like Posts or Pages) option from the Content Type drop down list. Enter a singular label for the custom post type you’re creating. For the purpose of this tutorial, we’ll call ours Document. Enter a plural label for the custom post type you’re creating. Following our example, we’ve set ours to Documents. From the Edit Pod screen, add as many custom fields as you’d like to the custom post type from the Manage Fields tab. Note: Custom fields are for storing unique data about each document such as a document reference number, file size, or download link. Don’t use them to add information that you’d like to be able to filter by; we’ll use taxonomies to do this. Finally, go to the Advanced Options tab and scroll down till you reach the Supports and Built-in Taxonomies sections. Tick any fields that you want to be available for your custom post type. For example, if you want to include an image column in the WordPress file manager then you should tick the Featured Image to enable this feature. Click the Save Pod button to proceed. We’ve created a custom post type that allows us to add documents to our file manager. We’re going to need a way to be able to group and filter those documents and files in the file manager. To do this, we’ll create a custom taxonomy using the same plugin. Head over to Pods Admin -> Add New and select the Create New option. 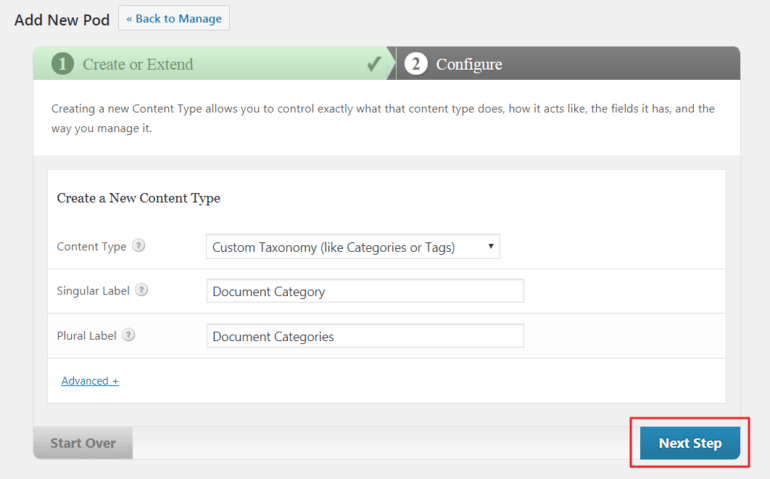 Select the Custom Taxonomy (like Categories or Tags) option from the Content Type drop down list. Enter a singular label for the custom post type you’re creating. For the purpose of this tutorial, we’ll call ours Document Category. Enter a plural label for the custom post type you’re creating. Following our example, we’ve set ours to Document Categories. Click the Next Step button. From the Edit Pod screen, navigate to the Advanced Options tab and scroll down till you reach Associated Post Types. Select the Documents custom post type that you created a minute ago and click the Save Pod button to continue. By now, we’ve successfully installed and activated the Posts Table Pro plugin to our WordPress website and we have a custom post type set up that we can add documents to. Adding documents and files to the new custom post type we’ve created is similar to adding new posts and pages. Following our example, we’ll add some documents and files to our Documents custom post type. Give the document a title. Add a short description in the text editor. 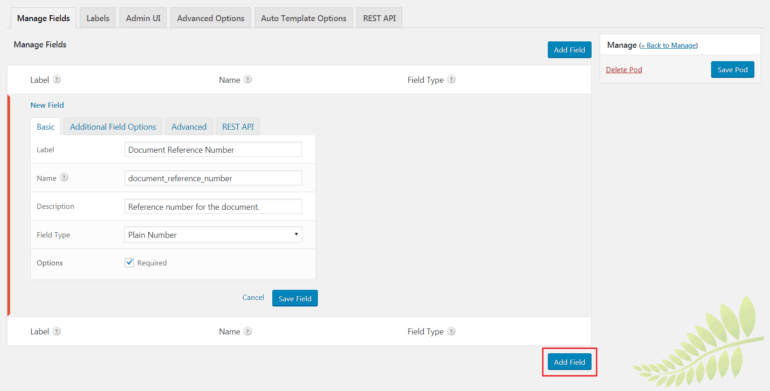 Add any custom fields, taxonomies, and/or featured image to store additional data about the document. As well as the data describing the document (e..g name, date, file size), you need to add the downloadable document. Please see our separate article which describes the different ways to create download links in Posts Table Pro. Click the Publish button to proceed. Repeat these steps to add all of the documents to your website. Tip: If you have lots of documents then you can bulk import them using the WP All Import plugin. Finally, it’s time to create your WordPress file manager and add your documents to it. Navigate to Pages –> Add New from the WordPress admin panel and create a new page where you want to add the file manager. Classic Editor – Click the ‘Insert Posts Table’ toolbar button. This adds a [posts_table] shortcode to the page. 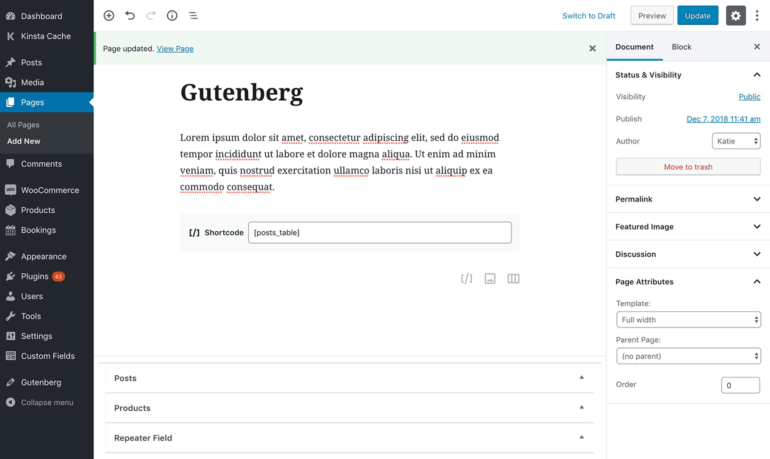 Gutenberg – Add the [posts_table] shortcode to a ‘Shortcode’ block. Navigate to Settings -> Posts Table Pro and set the Post type option to document. Set Columns to image,cf:document_reference_number:Ref. #,title:Title,content,cf:download_link,tax:document_category:Category. Make sure the Shortcodes checkbox is ticked. Set the Search filters option to Custom using the drop-down menu. In the Custom filters option enter tax:document_category. Set the Page length option to Hidden. Navigate to Plugins –> Add New from the WordPress admin panel and search for the WordPress Download Manager plugin. Install and activate it to your WordPress website. Next, navigate to Downloads -> Categories. You will be redirected to the Categories screen for the Downloads custom post type. From here, you can add new categories for the documents and files you’ll want to add to your WordPress file manager. Similarly, you can add tags by navigating to Downloads -> Tags. Once that’s done, head over to Downloads -> Add New to begin adding documents and files to your website. Give the document or file a title. Upload the file using the Upload/Browse/URL box in the sidebar. Add an excerpt in the Excerpt text box. Select categories and tags for the document. You will either add this to the main content area if you’re using the Classic WordPress editor, or to a Paragraph block in the Gutenberg editor. Finally, add a link (or button). For the purpose of this tutorial, I’ve simply linked the word Download to the URL http://www.test-site.com/?wpdmdl=465 since the ID of my downloadable document is 465. Be sure to replace the ID with those specific to your downloadable document. Note: You can get the ID from the Add/Edit Download URL. Click the Publish button to continue. Repeat these steps to add all of the documents to your website. Tip: You can create additional custom fields and taxonomies to display any further information about your downloads (such as file type, size, author, etc…). 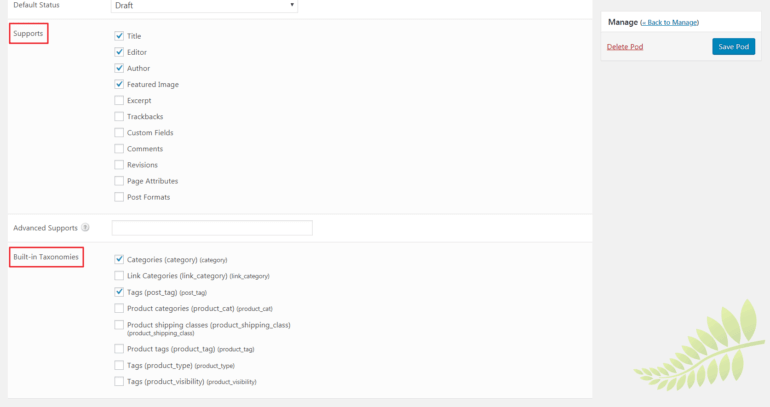 Lastly, we’ll create the WordPress file manager and add our documents to it.